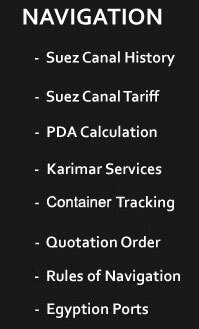 Suez Canal transit and all activities relevant to that service. Representing Ship owners wherever the ship calls at any one of the Egyptian ports. Attending Liner, Tramp and passanger ships. Attend loading/discharging operations and keep close contact with all concerned parties to gurantee speedy operations and avoiding any delay which consider undesirable factor against ship's owner's interests. We attend passanger ships with a tourism mentality based on long experince relevant to such specific activity in a way aim at avoiding any delay and undesirable consequences.